Suited for cleaning carpeted areas, VacRide(TM) employs dual brushes, vacuum motors, and HEPA filters to provide optimal soil removal and dust containment, while ride-on platform increases productivity and reduces operator fatigue. The 28 in. vacuum deck has standard side broom, and both together provide 34 in. total cleaning path. Also available, quiet mode reduces operating sound level to 64 dBA so staff can clean without disturbing building occupants. True vacuum performance on a rider platform helps cleaners finish big jobs quickly Advance (http://www.advance-us.com/)'s new VacRide(TM) is the industry's first machine to offer true vacuum performance on a rider platform. The VacRide combines the dirt pick-up power and certified-HEPA filtration found in many upright and wide-area vacuums with the only seated-rider vacuum platform. 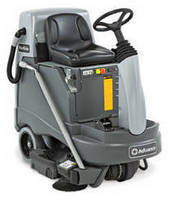 The machine cuts cleaning time for large carpeted areas, while also reducing operator fatigue. Dual brushes, vacuum motors and certified-HEPA filters make the VacRide the first rider vacuum with true vacuum performance. This combination provides soil removal and dust containment comparable to upright and wide-area commercial vacuums. The VacRide's ride-on platform lets cleaning staff drive the machine instead of pushing it, which increases cleaning productivity and reduces operator fatigue. "The VacRide fills a need in facilities that have large, carpeted areas to vacuum," says Sara Thurston, commercial market manager for Advance (http://www.advance-us.com/). "Until now, there's been no efficient way to vacuum open spaces with lots of carpet - places like hallways, large conference rooms or lobbies. In fact, I think cleaning those areas is a major pain for many people because the job is so tiring and time consuming. We're excited to offer a machine that provides a better method for these large expanses of carpet." Advance (http://www.advance-us.com/)'s VacRide features a 28" vacuum deck with a standard side broom, which together provides a 34" total cleaning path. A large 1.2 ft³ bag lets operators clean for longer periods of time before changing the bag. At the touch of a button, quiet mode reduces the operating sound level to 64 dBA, allowing staff to clean during the day without disturbing building occupants. A detailing wand lets operators reach hard-to-clean areas such as baseboards without leaving the operator compartment. Excellent sight lines allow operators to see within 7" of the front of the machine. The VacRide fits through doorways and in standard elevators, and an optional 25' S-wand attachment offers the ability to clean areas that the machine is unable to navigate. Advance is a brand of Nilfisk-Advance, one of the world's leading manufacturers of high-quality commercial and industrial floor maintenance equipment. For more information on the new VacRide rider vacuum, call 763-745-3500 or visit www.advance-us.com.